Aloysius Ikegwuonwu,(alias) Bishop, alleged target of the August 6th massacre at the St Phillips Catholic church in Ozubulu in Anambra state, has finally speaks out regarding the sad incident. 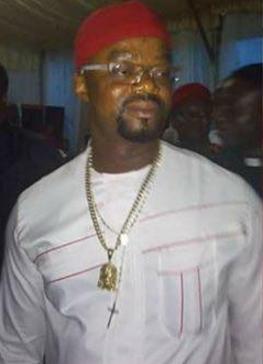 Bishop who was at the palace of Igwe Nnamdi Oruche, the traditional ruler of Ozubulu when Anambra State Council of Traditional Rulers paid the monarch a condolence visit on Tuesday, August 15th, urged the traditional rulers in the state to invoke the spirits of the gods of the land to reveal the perpetrators of the massacre. According to the Sun, Bishop said that since the traditional rulers were custodians of tradition in their various communities, they would pray that gods of the land should reveal the killers of the church worshippers and bring them to justice. He stressed that the various empowerment programs he has initiated are pointers to the fact that he is a peace loving person. He added that God has blessed him enough to help others and that people should not be envious of that. He advised those making negative statements about him to stop immediately. It has been alleged that the attack is as a result of a drug deal that went south between Bishop, a suspected drug dealer, and another alleged drug lord, in South Africa.